"This is WONDERFUL! 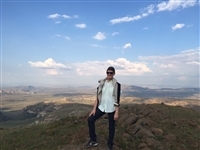 Thank you, Sleeping-OUT and thanks to Thanda Vista, too, for participating in the FA Program." South Africa boasts many beautiful places - and we believe that Plettenberg Bay is the most beautiful of all. That's why we've called our house "Thanda Vista". Thanda is a widely used word for "Love" in the African languages. 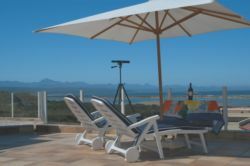 Thanda Vista is an exclusive Bed & Breakfast establishment just minutes from the white sandy beaches of Plett (Plettenberg Bay) on South Africa's Garden Route coast. Watch whales while you breakfast, stroll down to the lagoon, relax on Plett's pristine, quiet beaches (Poortjies Beach is a mere 300 metres from our front door), or head out for a round of golf on any one of the Garden Route's championship courses - or any other of the many activities available in the area - and come home at the end of the day to Thanda Vista. Intimate, exclusive and private, Thanda Vista offers 5 luxury en-suite bedrooms. A guest lounge with library, music centre and desk-top computer (with free Wi-Fi broadband internet access); a breakfast room with magnificent views of the Bay; roof-top terraces for fantastic whale watching; and on-site parking.